If you know me, you know that I really just want to be a stay at home mom. However, it's not possible right now. Luckily, I work for a great boss who is flexible with my schedule and I have a great sitter - my sister in law - who watches Baby O a few days a week. 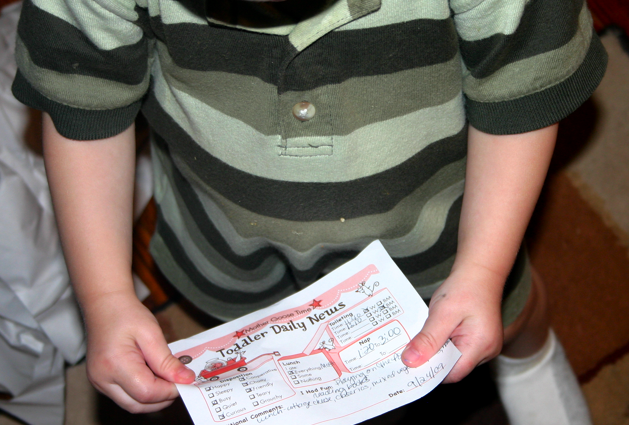 One of the little treasures I look forward to when I get home from work (besides hugs and kisses from O) is Toddler Daily News. I love to see what he's been up to for the day! Awwww, Joni, thanks. You are making me cryyyy! We love having Owen over to visit us! He is the sweetest and cutest little guy ever! That is the sweetest thing I have ever seen. What a great way to make parents be a part of their child's day. Tell Kim that is so clever. You will have to give that idea to Jord so that he can make a Baby news for Rach when she is gone!